Saatva Mattresses: Which one is best for you? We are supported by our audience, if you choose to purchase an item featured here, we may receive a commission. I sleep on my back less than 10% of the time, so this list is a little bit of what I think back sleepers would prefer mixed in with what I like to sleep on when I have to sleep on my back. Long story short, I’m a side sleeper. That said, I have slept on each of these mattresses for at least 2 weeks and in the case of 3 of them much longer than that. Does it surprise you to know that only 4% of the people I surveyed sleep on their backs? Unlike many of the review sites out there, I sleep test every mattress that I review for about 2 weeks. This means that I can only get to 20-25 mattresses per year, so I am pretty selective about the ones that I choose to test. Everyone has different sleep preferences and there is no one solution for every sleeper. Let’s discuss the best mattresses for back sleepers! I’m a side sleeper so I don’t spend as much time on my back. However, now that I have discovered adjustable bed frames (like the one I currently have); I am able to spend much more time sleeping on my back. This link will take you to a human egg drop test that I tried in my bedroom. A back sleeper is “using” more surface area of the mattress, so they have a potential to heat up; therefore all of my picks for this category have cooling tech in them. Another issue that Back Sleepers commonly face is SNORING. I have suffered many sleepless nights due to my husband’s snoring, that is until recently. Do you want to know what has cured his snoring? Of course, you do, you may even be suffering from the same situation. Hurry up RANA! My adjustable bed’s anti snore position! Seriously, I hear a snore, I wake up grab the remote and with one touch the bed’s head position raises a few inches and the problem is solved. I’m in search of an adjustable bed that is integrated with smart technology so that it will automatically adjust. I believe that I found this solution at the CES in Las Vegas. I haven’t had the chance to put it to the full test, but I’m extremely excited to try it. The Pricing Table below is as of 5/2/2018. I have an affiliate relationship with DreamCloud, Purple, Leesa, Brooklyn Bedding and Tomorrow Sleep, which means I can pass along some great savings with the links below. You can read more about my affiliate relationships on my disclosure page. Full: 54″ X 75″, which is a good size for teenagers as long as you don’t expect them to grow to six feet tall. Queen: 60″ X 80″. It fits two adults, but you had really better like each other as you will be very close. King: 76″ X 80″. This gives two adults more space, but has the same amount of leg room (height) as a queen. California King: 72″ X 84″. This will give plenty of room to two adults and allow people in the 6’6″ range the ability to sleep on a bed without dangling their feet off the end. For more information on mattresses sizes go to my size comparison page. 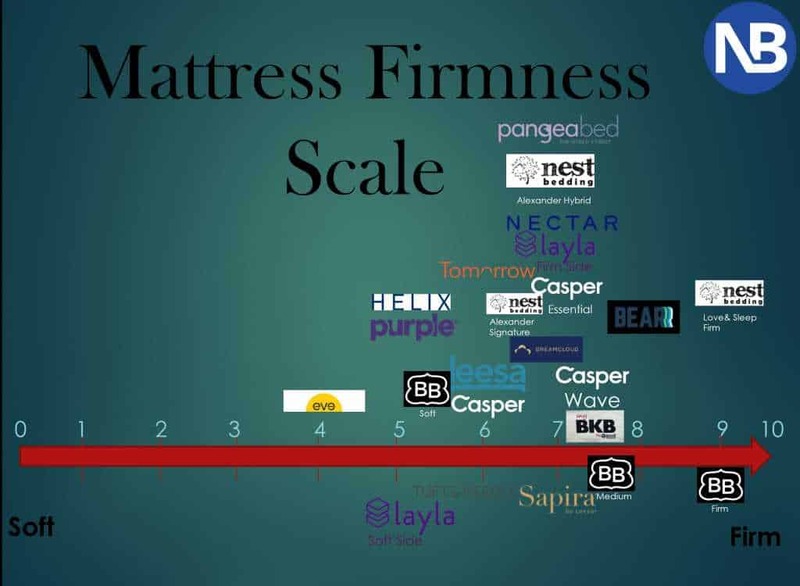 We use 10 categories to rate the mattresses we sleep test. Each category is scored 1-10. Unlike other reviewers we aren’t scared to give a mattress a low score if it is deserved. 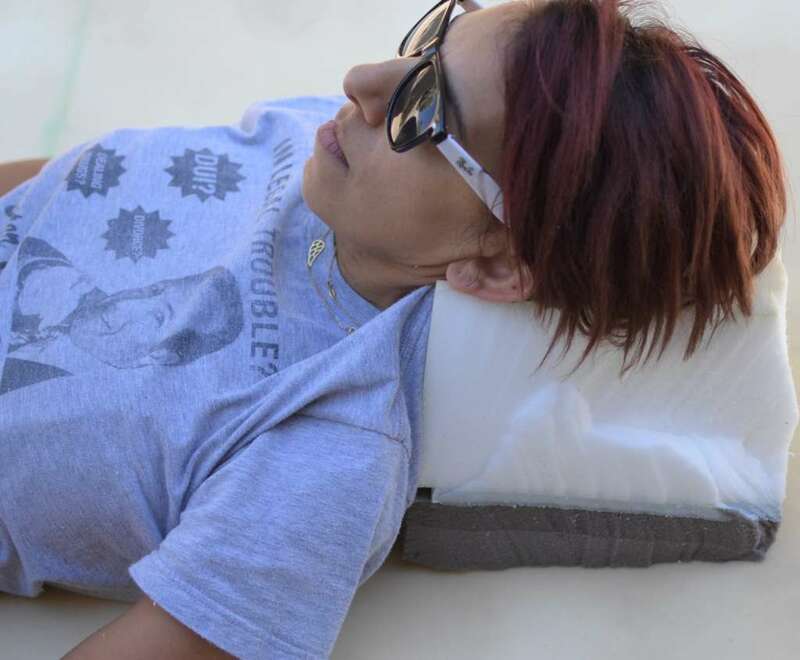 If I spend 2 weeks sleeping on a mattress that consistently gives me back pain, you will read about it on my review! First Impressions count right? Some of the mattresses come in boxes, and some come in over sized bags. I prefer boxes as they are much easier to move around. Some boxes have cute logos and some have really fun quotes, and yes I really made a video called box vs. box vs. box in a box. Try saying it fast three times in a row. Did you get tongue tied? On the subject of first impressions, some of the mattresses will have a bit of an odor when they are unboxed. Most people use the term off-gassing to describe it. Some of the mattresses take a few days for the smell to go away and sometimes it is barely noticeable. When you lay on a mattress and it’s not comfortable that’s surely something that we should point out right? If I’m having trouble sleeping on a bed, I’ll tell you that. If I can’t sleep on a mattress I will scream to high heaven that you need to steer clear of a mattress if you have a similar sleep profile as I do (petite side sleeper). Remember, just because it doesn’t work for me doesn’t mean that it won’t work for you. This is a key category to focus on when you are going through my various reviews. The more mattress that I sleep test the larger my comparison database gets. If you ask me about 2 mattresses that I have tested, I can instantly tell you which one was more comfortable to me. If I fall all the way through the mattress to the ground, it won’t score very high. Conversely, if I hardly notice any sinking in the mattress it will get a high score. Recently we added adjustable base tests to our review process. How do different mattresses stand up to the test? Have you ever walked into a mattress retailer? Of course, you have! Did you notice that almost every mattress is now on an adjustable base? This is the wave of the future, I know that I will never sleep on a bed frame that isn’t adjustable. Sure, I’ll test different frames and foundations, but my go to sleep set will always be adjustable. It’s hard to explain, but once you try one you won’t go back. I even credit my adjustable frame with curing my husband’s snoring with just a click of the anti-snore button on my remote. With the hundreds of new brands that have popped up over the last few years it is difficult to sort through them. I’m putting in the leg work to figure out which companies are connected to each other. In doing so I can help determine the expected longevity of each of these mattress companies. If I don’t think a mattress company is going to make it in the long term, then I won’t expect their warranty to hold up. A company my promote a forever warranty, but if it closes down in six months you surely won’t be able to get your bed replaced. I use Fakespot to see if companies are planting fake reviews. You will be amazed by some of the results some of these online retailers get on fakespot. I research other review sites to see which ones are owned by mattress companies. For example; Sleepopolis, mattress clarity and slubersearch are all connected to Casper. Community outreach by the company: I love companies that give back to their communities. If your company is holding an event for the community in the Phoenix area let me know and I’ll cover it. Customer support: If a company has poor communication or support, you will read about it here or hear about it on my video reviews. Warranty: the companies in our top categories all score highly in the warranty field. If we don’t think a company will be around to honor their warranty they won’t be included on our list. When I’m standing on a bed and a wine glass doesn’t move when I walk near it, it will score high on this test. A high number is great for when you have a partner who is tossing and turning and not disturbing you. On our scale from 1-10, one is a waterbed, 10 is; wait what? There is someone in the same bed as me! If I’m not able to sleep on a mattress, then it’s possible that you may have the same issues. This is really the most important category that a buyer should be focused on. It is nice when a bed is well constructed or made by a reputable company. However, if you can’t sleep on it, you are going to find yourself shopping for a new bed sooner than planned. I live in Scottsdale; Arizona and I’ll tell you a little secret about the weather here… It gets hot in the summer. Having a breathable mattress is a must here. There aren’t a ton of things worse than having extra heat rising up from your mattress making your back or side sweat. I’m a huge fan of talalay latex, gel infusions, and alternative construction (like Leesa’s Avena foam). Surely what’s inside the mattress matters right? I also pay close attention to the covers. Size matters; the Casper Essential is 8.5″ while the DreamCloud is a full 15“. Almost double the thickness of the mattress, but is it double the price as well (no)? You really have to look at the prices of the mattress vs. the competition. Not just the direct to consumer, bed in a box model, but the in-store values as well. The bed in a box model offers consumers huge cost savings vs. buying from the store. This is because the middle man is cut out and the companies don’t have to pay electricity and rent. We give each category a score from 1-10 with 10 being the highest. I am using a 10 point must system. The mattress that preformed the best in a category gets a 10 and all other mattresses are judged against that standard. Recently, we noticed that just about every mattress you see in the store is staged on an adjustable frame. These giant retailers must be on to something right? So, we decided that every mattress we test should also go through a few cycles of adjustments with our adjustable bed. Currently we are using a Rize Verge. We assume that other adjustable frames will have many of the same characteristics. What we have found is that some mattresses don’t fare well on an adjustable frame, while others take a step up to a new level. If you haven’t been on an adjustable frame you are really missing out, so we feel that it is crucial to our review process to add this wrinkle. We understand that everyone doesn’t have an adjustable bed, but if you are considering one with your next mattress purchase we feel you should be prepared. If a mattress is too thick or sturdy, it likely won’t perform well on an adjustable base. If it has interlocked coils, forget about it. Why Buy a Mattress Online? Wouldn’t you rather take some time to test a mattress rather than just be lead around by the salesman to the highest commission bed he sells? Most online retailers offer a trial period of 100 days or more to test out your new mattress. Same quality mattress for a fraction of the cost. You have more time to comparison shop from your home. Thinking about buying the items we have reviewed? Help Non-Biased Reviews out if you do. Just click on any of the seller links above and the seller will contribute a portion of the sale to help support this site. It won’t cost you anything extra and is a simple way to help us fund more items to review. Thank You! I'm a side sleeper so I don't spend as much time on my back. However, now that I have discovered adjustable bed frames, I spend more time sleeping on my back. Will Melatonin Improve my Sleep? I receive a commission when you use the links on this website to purchase items. I give back to the community by using those funds to give you an extra $25 off a mattress or adjustable bed on this site. If there is enough left over I’ll host and pay for giveaways. Best Mattress for Side Sleepers (Like Me)! Where Was Your Mattress Made? Do at Home Return Policies Increase in Mattress Returns? Why is Copper Showing up in so many Mattresses? 2019 Non Biased Inc. All Rights Reserved.